Happy with how far Chrono Trigger got, and befuddled at how long Banjo-Kazooie lasted. I didn't participate though, so I can't complain. I have no real issue with the winner. Banjo deserved how far it got! Why didn't you partake? I was pleased with how far Xenoblade, the original Zelda and Melee made it. And how not far Resident Evil 4 made it. I didn't participate either, but I wish I did! Donkey Kong, even though it only took a single round. I'm just surprised that it overcame Metroid: Zero Mission. I'd say Nintendo Land had it rough. Going up against Super Metroid right at the start? That's a tough battle. Each region has its share of my favorite games, but I'll give it up to the Hyrule Region. It has the most games that I'd consider voting for against Ocarina of Time, and that's saying something. I think Kirby Super Star would have been a strong contender. Are you saying 'boo' or 'boo-urns'? I'm saying... Boo...german should have made the list. 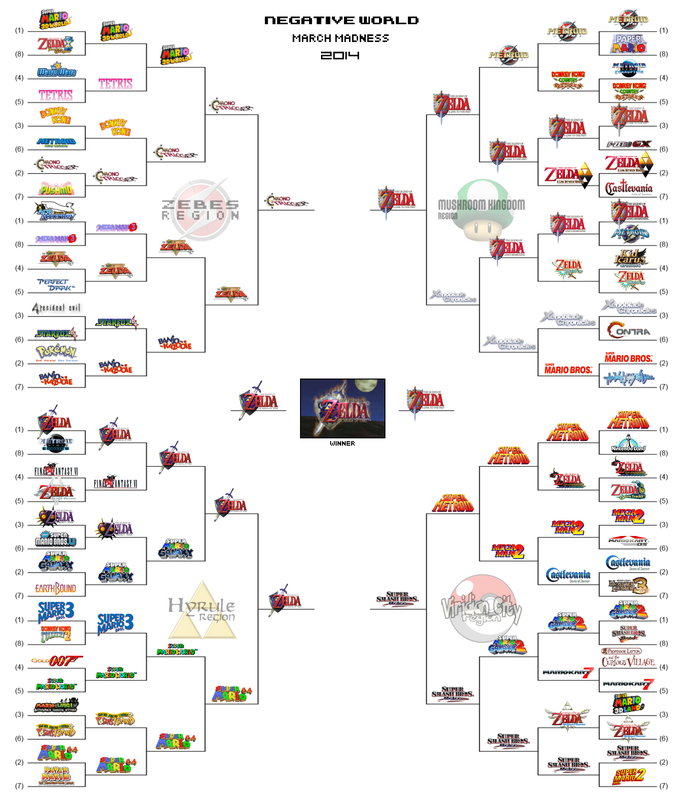 Final Fantasy III drew Ocarina in Round 2; I've got them easily over anyone else in that branch. And Chrono Trigger..maybe these games are just too niche?, I don't know. I think I've officially spent more time with Monster Hunter Tri / 3U than any other game, especially as far as recorded time goes. I MAY have spent more time with my NCAA Rosters / Madden stuff through the years. Actually, I probably have. But as far as REAL games go, MH takes the cake. EDIT- In the actual NCAA tourney, don't teams have to "play in" to even make the brackets? I wonder what would happen if we opened it up to 128, and let some of those lower voted (though highly scored, or maybe not scored quite as high) games into the mix (within reason); like, Double Dragon II. Ninja Gaiden. Those games aren't anywhere near here. I dunno, I was doin' stuff. Which game had the most unlikely run? Resident Evil 4... for how short it was. Which game got the shaft with a particularly difficult road? Resident Evil 4. Which region had your most beloved games? Maybe Mushroom. Link to the Past, Metroid Prime, and Xenoblade? Sure thing! Is there any game not featured that could have made waves? Fire Emblem Awakening seems pretty well loved here, it'd if we counted games with only 20 votes it'd be #2 behind Ocarina of Time in our highest rated games ever list... which seems a bit insane. Why wasn't it included?! Cave Story maybe? Donkey Kong Country 2? Resident Evil 2 (GCN) perhaps? I'd like to think an Advance Wars game, Dual Strike probably, could make a splash... but probably not because you people are all insane. Perfect Dark and Earthbound probably got shafted. Though, anything that goes up against Super Mario Galaxy is probably getting the shaft. I'm curious how far Mario Kart Wii might've gotten in this thing. I'm curious, what did you use to count the votes? If there's some sort of thing that can scan the text on the page, that could help with Survivor Polls and such. I just counted all conforming votes with a tally on a piece of paper. No special technology. Found this the other day. Verrrrry interesting.. The 2.55M in Japan called it FF6. EDIT: Actually the DS remake of FF3 (the real one) outsold FF6 in NA. Good point. Why have an entry for FFVI on SNES at all if you're going just to put all those sales into the wrong category? The America-centric viewpoint strikes again I see. Hey, I didn't make the site. No, but I am confused by what point you are trying to make. FF6 sold more where it was called that instead of 3 and FF3 for DS sold more than FF6 being called 3. It seems to me like your original point was going to be something along the lines of 'more people recognize it as FF3'. Seeing that this is not the case are you abandoning that argument or are you revising your stance based on new evidence?